It’s been over six weeks since lava fissures began erupting on Hawaii’s Big Island, and there’s still no end in sight. 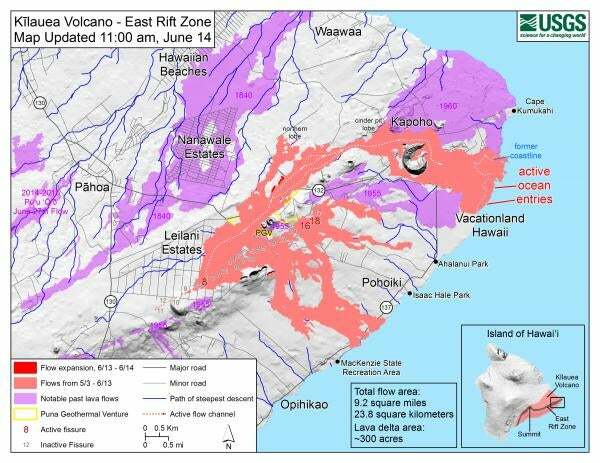 New videos taken by the US Geological Survey reveal the dramatic extent to which the encroaching lava has reshaped the surrounding landscape, turning once gorgeous beaches into a smouldering pile of volcanic waste. This video, which was captured during a helicopter flight over the lower East Rift Zone on the morning of 14 June, shows the lava spewing from Fissure 8 as it continues to feed channels of molten rock flowing into the ocean. 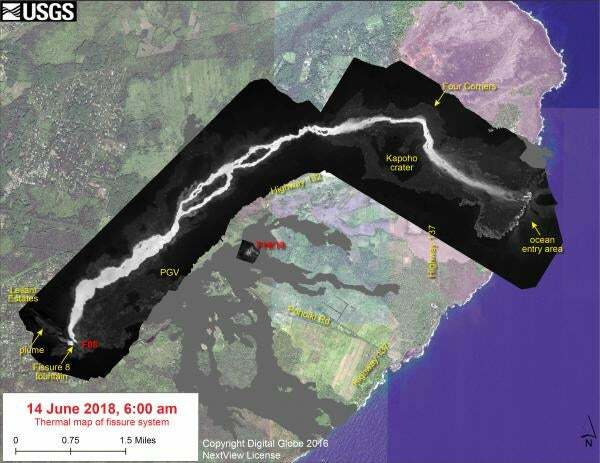 The channel is currently moving in a northeast direction before it turns eastward toward the sea at Kapoho Crater. The video of the shoreline was taken as the helicopter travelled from north to south. The devastation seems to go on forever, but the affected shoreline is roughly a mile long. As the video shows, no stretch within this area has been spared—it’s total devastation. Small litoral explosions, when lava from the channel hits the ocean, can be seen, along with several plumes of toxic laze. Meanwhile, a second video released by the USGS shows what’s going on at Halema‘uma‘u crater at Kīlauea’s summit. This drone footage, captured on 13 June, is providing a unique look at the gigantic hole, which began erupting in mid-May. The UAV footage allows officials and the public a close look at what is clearly a very hazardous area. The perimeter around the crater can be seen slumping inward and downward. The deepest part of the crater is now about 1,000 feet (300 m) below the rim. The flat section at the bottom of the crater is the former Halema‘uma‘u crater floor, which has dropped at least 300 feet (100 m) over the past several weeks. Ground cracks near the crater rim can be seen cutting across the car park, the former site of a visitor overlook (which was closed back in 2008).